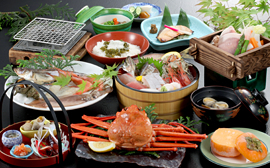 Sado Island, which is surrounded by the Sea of Japan, is a treasure house of delicious cuisine. Based on the concept of eating foods in the season they are most delicious, Yahatakan uses the finest seasonal ingredients – with a focus on seafood – produced in Sado. For example, Koshi Hikari rice from Sado is of the top class even among rice grown in Niigata Prefecture. 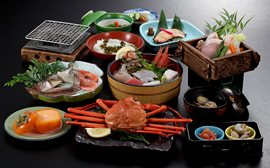 This high-grade plan includes grilled abalone and sazae (turban shell). The highlight of this plan is the assortment of sashimi – the largest of any plan – served in a vessel that resembles a round wooden boat. Choose this plan to savor the flavors of Sado, including Okesa Kaki persimmons and rice bowls with mekabu seaweed. This standard dining plan, which includes a large assortment of sashimi served in a round wooden boat, is the most reserved plan at Yahatakan. Sado-style beef grilled with miso is also available. This reasonable dining plan is for people who want to save money during their stay. 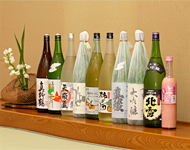 The Japanese sake produced by the climate and natural features of Sado features a range of unique flavors and strongly expresses the characteristics of the area's land and culture. The rice and water used to make this sake – which has won many awards – are of excellent quality. We definitely recommend savoring sake together with your meal to experience how it matches with food.